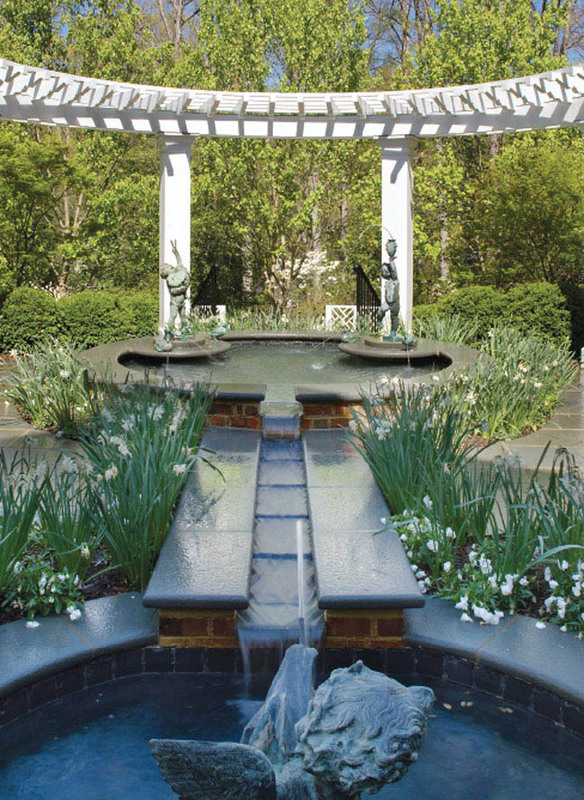 Outdoor water fountains range from formal to ironic, depending on the homeowner’s taste. 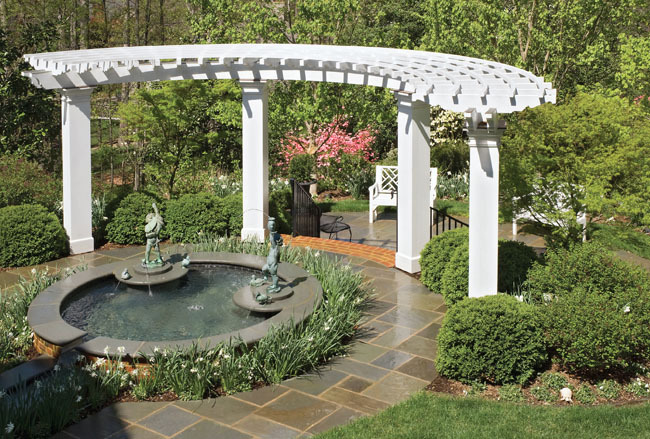 This one clearly reflects back the elegance seen in the stone patio and half-circle arbor. 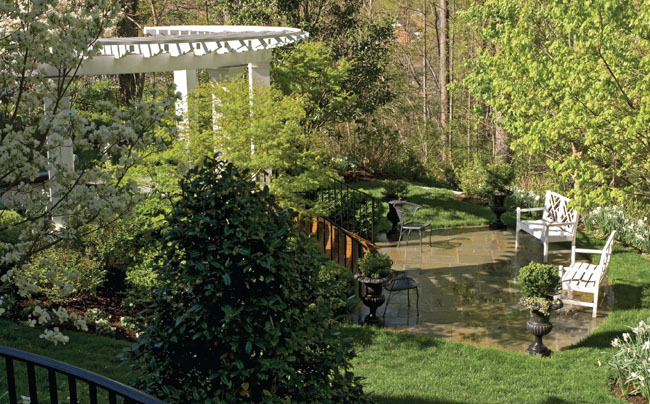 Sometimes, “less is more,” specifically when it relates to the development of eco-friendly landscapes. 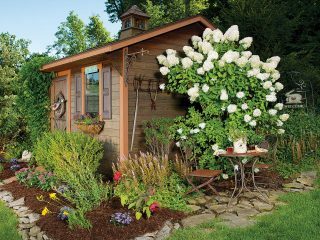 This bit of advice is exactly why the garden ideas put into place by Alice Siegel and her husband, John, created such a luscious landscape that is appealing to all. 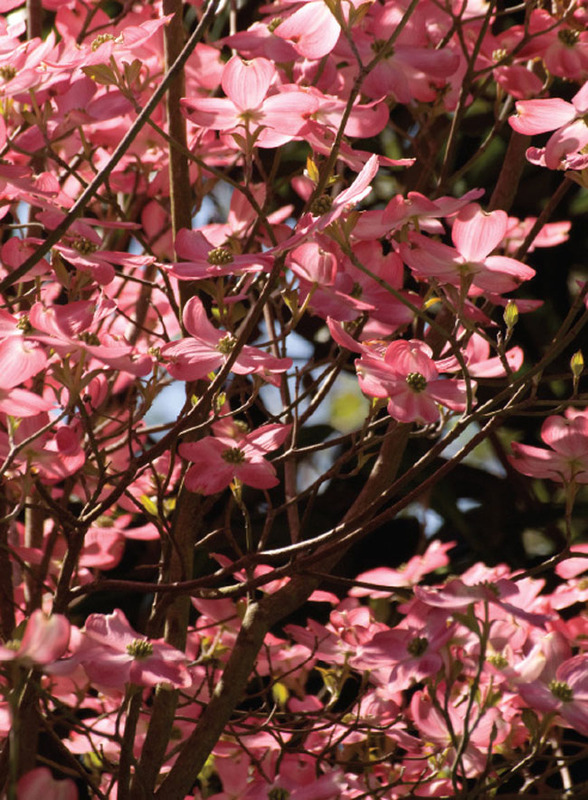 “We wanted to create a central Virginia traditional landscape that is compatible to its surrounding native environment,” says Alice of the landscape grounds surrounding her home in the Lockgreen community near the James River. While Alice and John’s goal sounds reasonable, their site contained almost insurmountable obstacles. 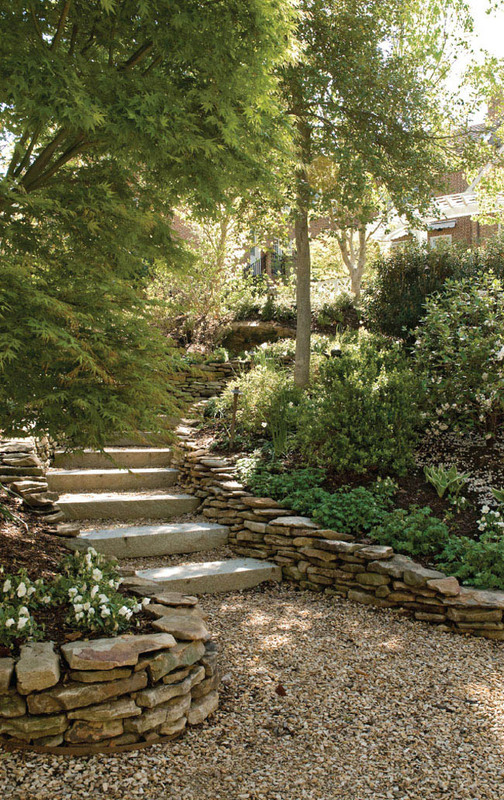 Faced with severely rocky terrain, landscape architect David C. Gerstenmaier, president of Richmond-based Higgins & Gerstenmaier devised a plan to create layers of sloping terrain to serve as hosts to garden features and sitting areas. Presented with many challenges, the plan separates the steep slope into three terraces: one for entertaining, one for dining and one for quiet reflection in the woodland. Working with Jonathan Cranshaw of Ground Effects Landscape Construction, the blue stone terraces, water feature, brick wall and steps were installed. Equally challenging was the installation of pathways. To control water run-off and absorption, they used a tan colored crusher run stone, with steel edging on each side. To create the look and feel of stacked rock walls, they installed natural stone retaining walls. 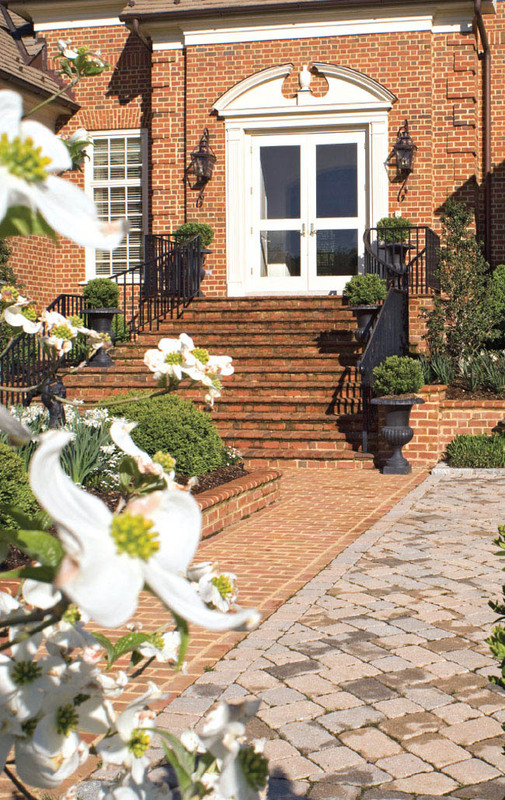 Daffodil plantings frame evergreen plantings and are installed along descending pathways. As the soil warms, so does the landscape palette. 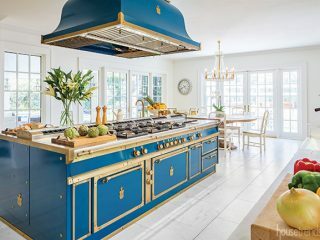 Along with a design that consists primarily of a white and green color scheme, splashes of blue-tone blooms emerge. Dwarf lavender lilac frame the garden’s water feature, a blooming pink dogwood draws attention to the area’s outer boundaries and lavender blooming rhododendron contrast against white blooming azaleas.